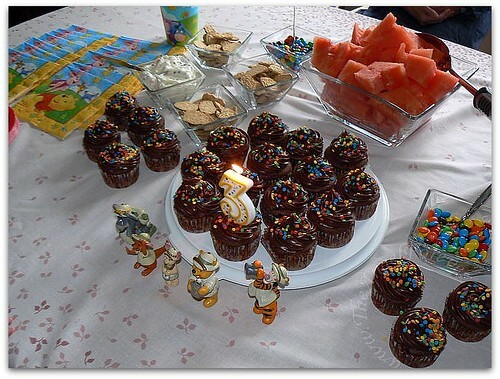 3rd Birthday Parties, Cupcakes and fires…oh my! 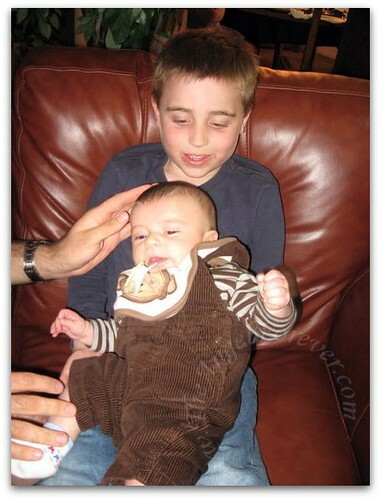 Friday was JSL’s third birthday. 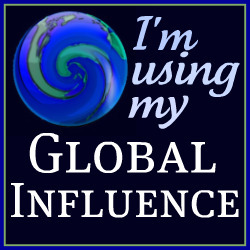 Thanks to this, the weekend involved lots of celebration, family and goodies. 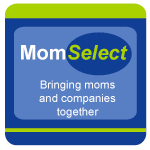 It has also left Mommy, Daddy and the boys quite tired. Here is a look at Friday and Saturday and a sneak peek from today’s family party. 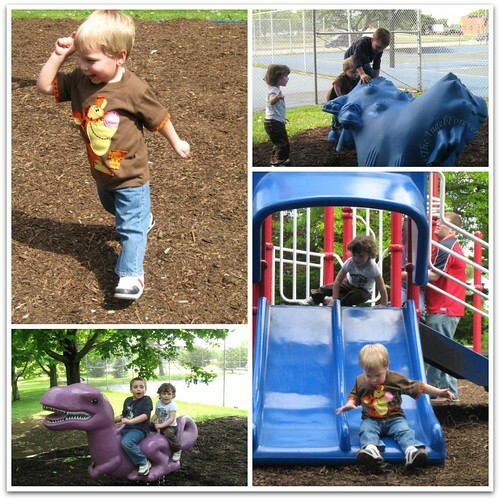 We went to the park with big brother, Uncle I and Cousin SG for fun on JSL’s birthday. Later on Friday, we had dinner at Nana and Papa’s house with Mimi. Lots of time for the four cousins to play. Baby BA has gotten so big. 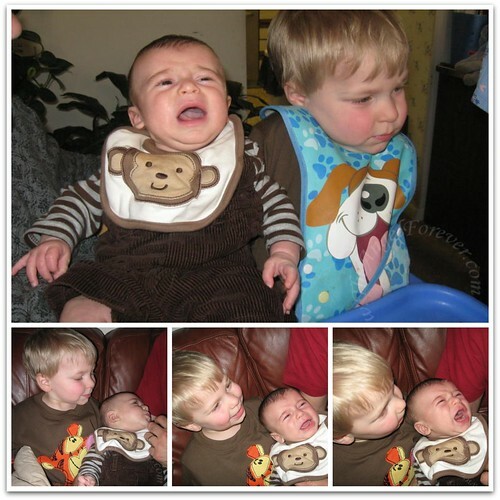 After a bunch of dirty looks from JSL (while I was holding the baby), he warmed up and wanted a closer look at his baby cousin. NHL also asked to hold him with some assistance. Thanks Aunt M for saying it was fine to try later one with some help from one of us. He was a very proud big cousin. 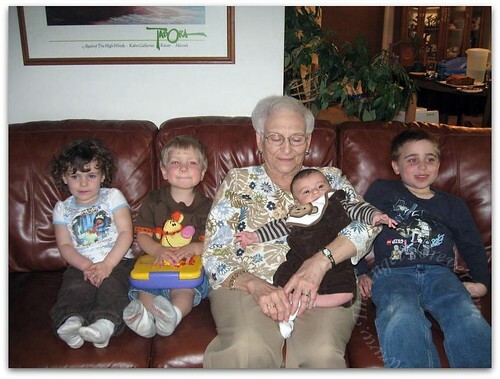 Of course, we had to take a photo of Mimi with all four of her great grandkids. This is one of the better shots. Saturday, we spent the day with Bubbe and Grandpa who were in town for the weekend. First, we stopped by NHL’s school for their fun day. NHL was so proud to introduce his grandparents to teachers, friends and anyone else that he knew. We walked around the school showing them classrooms, the computer lab and stopped by NHL’s reading display. 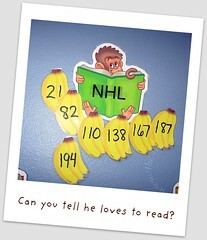 Yes, from last July to the end of April NHL read the number of books on the monkey banana chart. below! 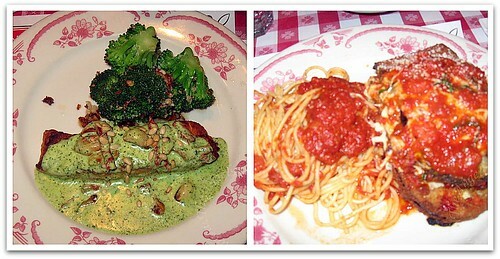 Of course, we also took photos of the meals that we had. Yes, it was just as amazing as it look (probably more so). Then we went shopping at L.L. Bean and after to get some food for the party. After a rest at our house, we went back out to dinner at a delicious local Chinese restaurant. Then Bubbe and Grandpa went back to the hotel while we stopped at the store quickly. We had some cooking and baking to do once the boys were in bed. Early this morning, we packed up and went to Nana and Papa’s house to get the party started. We had food to make/bake, cupcakes to frost and fires to put out. <— WHAT? Oh yes, we had a small fire in the oven. Everyone was fine after a little fun and "excitement" thanks to the fire. I will leave you with a look at the Winne the Pooh cupcakes display from the table. More food photos coming soon. Now, it is time for all of us to rest up some. It has been a busy weekend. Fire just makes it a little more fun! Glad that overall it was a great birthday celebration weekend! 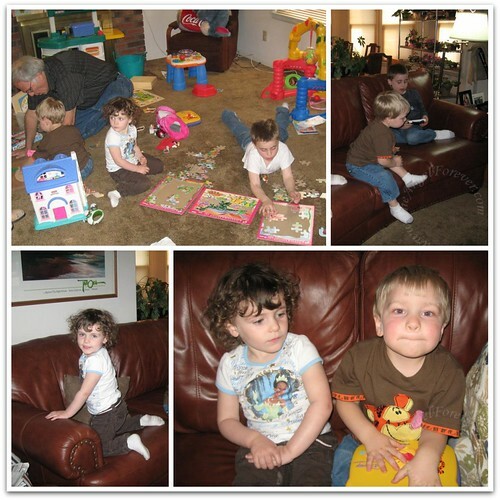 How in the world did you get FOUR kids to sit reasonably still and look up at the same time?!? Say what you will, I think that’s an amazing accomplishment! Also, I think I missed it but NHL has gotten really tall!